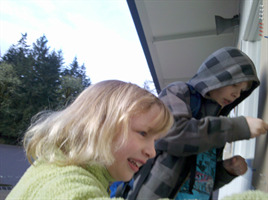 I drove Sam and Emma off to school this morning, along with Sophia. It made for a long commute, but everyone was in good spirits and I watched them play with the push pins on the bulletin board while they waited for school to start. They were there pretty early, but evidently it's a normal thing for them. Eventually Sam told me I better be going and Emma gave me a goodbye kiss. I made corn chowder and chick patties for dinner last night, while helping Sam with math. 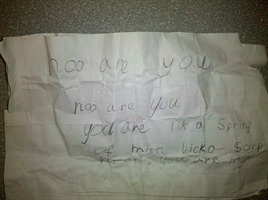 He had intentions of working on spelling as well, but never quite got to it. Emma dug things out of the craft room and made things. I ran between the two of them and dinner, offering assistance while I could. Emma and I loved the homemade chowder, and Sam ate a reasonable amount. We had a typical post-dinner routine. Kids were bathed and showered. Dessert was eaten. Sam wanted a peanut butter sandwich for the first time in ages. After I got Emma into bed, I taught Sam how to use my old cell phone. His first task was to set a picture of a goblin as the wallpaper, as his nickname is Splug (the goblin). 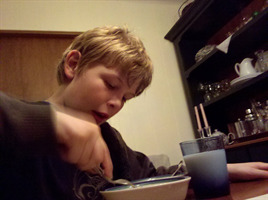 Sam woke up with only minor prompting again this morning, beating Emma to the breakfast table. He turned on the television, realized he didn't want to watch anything, and announced that we don't watch television here any more. I agreed, and need to fall back to basic cable in hopes of getting my Comcast bill down. I was a little sad sending my kiddos off for the next few days. For the next few days I'll be hanging out with Joanna and her kids. Tonight is dinner and swing dancing. Should be fun. Sam and Emma were dropped off late on Sunday. Sam was starved for Internet access and Emma just wanted to hang out with me. I'd gotten her a swimming suit that she had to immediately wear. She helped me cook dinner with it on and later decided to wear it as pajamas. It was very cute. We watched the first Mythbusters of the new season. I had Sam make himself a hamburger and home fries, while Emma and I had rice noodles. Emma's enthusiastic about learning to cook. Sam needs a bit more prompting, but he ends up being more interested in eating things he makes himself. My goal is to expand his repertoire beyond frozen waffles. There was no school on Monday, but we managed some shuffling of kids and they were all okay. Sam had a hard time sleeping as he got sand in his eye while at the beach, sleeping until nearly 11 a.m. Emma went to my mom's in the morning, both kids went to Sharon's to play with John and Natalie, and then I picked them up after work. We had a good night. 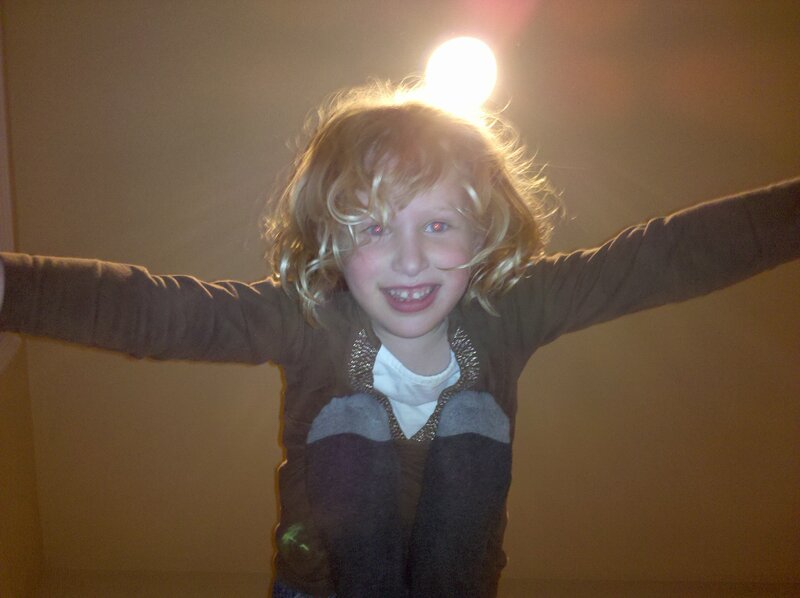 Since there was no homework, I hauled the kids into the basement and we spent a half hour making up fun, active games. Radioactive Ball was the usual hit, and they also had a good time holding on to me and preventing me from walking around the basement. Airplane rides were given. Eventually we got tuckered out, I got Emma to bed, and watched Sam build Super Mario levels before sending him to bed early. This morning everyone was in a cheery mood. I serenaded Sam using a guitar app on my Droid. The lyrics didn't rhyme, but he eventually woke up well enough to get him up and about. They both ate huge amounts of food, the television turned off, and everyone talking instead. Tonight the plan is to get Sam trained on my old cell phone. I'm not sure how much he'll really use it, but the cost is minimal as long as he doesn't use it much. Then it's a few days away until they return for an Easter weekend extravaganza. Joanna and her kids are coming over to dye eggs, eat food, watch Ponyo, and hunt for eggs. I think I'm more excited than the kids. My life is always interesting these days. This morning we were driving back from Creswell when we came across a herd of sheep. I somehow managed to get them off the road and into a pasture, though admittedly it was mostly because I kept slowly driving forward. Other motorists had stopped on the side of the road, and I had fun exchanging witty comments with them, such as "Say, are you looking for some sheep?" Good times. Sam and Emma are still at the beach, but hopefully will come home in a couple hours. I was going to do a big get together and watch Ponyo. Sadly I couldn't get Ponyo at the video rental and since they're coming in so late, I'll just have a somewhat quiet evening of hanging out with them instead. A new Mythbuster's is out, so we'll watch that and eat pizza, a final hurah at the end of Spring Vacation. Tomorrow they don't have school, though, so I've got to figure out what to do with them. I'm resolved to do mostly practical things until they return. I have laundry to finish and the downstairs office to pack up. It feels good to accomplish things yet again. We just finished eating outside on the patio, the first time this Spring. Joanna's thrown her kids in the bath and I have a few moments before I need to assist with dishes or reading books and the like. I think this is the first Saturday I've been over at Joanna's as usually I have my kiddos, but they're still at the beach with Jamie. I've kept exceedingly busy today to stave off my pangs of missing them. I talked to Emma briefly Wednesday night, and Sam on Friday in hopes of getting his opinion on some swim trunks I bought him. 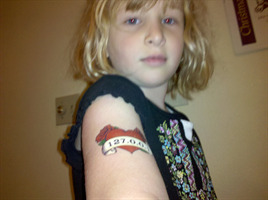 Hopefully the pirate symbols aren't too uncool. Friday night we all went swimming. Berry loves the water and Duncan is slowly getting more comfortable. He's so tall that he can stand up in the shallow end. This morning began with crepes and whip cream, along with a mocha for me. That kicked off a frenzy of activity. Emma's too small clothes were pulled out of her drawers and everything was arranged logically. Sam's future bedroom was cleaned out a little more. Laundry was done. The shed windows got curtains. I screwed up the coat hanger that had fallen down. I fixed the trellace that had fallen down in the night. We didn't make it to pick up new fruit trees, but I felt tremendously productive. We then went to Joanna's and the working frenzy continued. While the kids theoretically napped, I cleaned out Joanna's car. The dirt I could understand, as such is the result of having children to move about. The vast number of pens and pencils was remarkable though, and I had to have a little talk with her about only being able to pick two. There was lawn mowing, vegetable planting, compost turning, and chicken feeding. Bikes were ridden to get the mail. I helped make dinner and we all sat out on the patio while Duncan played Beyond the Sea over and over. At least the boy has taste. I'm very excited to see Sam and Emma tomorrow. I'm hoping we can watch Ponyo and eat pizza tomorrow night, after a day of relative laziness. Sam will be desperate to get on the Internet, I'm sure. I'm not sure if Joanna's family will join us, depending on how everyone is feeling. It's been a good weekend so far. I like the mix of work and play in an appropriate balance. My old friend from SEHS, Tove, wrote & posted this little poem on Facebook. Thought you all might enjoy it! Just a reminder to everyone that tomorrow at 8:30pm is Earth Hour. Turn off your lights!! I'm in the planning phase of Mocha Friday, trying to figure out how I'll coordinate getting that delicious beverage. Somewhere between Joanna's and work there's got to be a good coffee place. Wednesday after work I got Emma from my mom's, and cooked them up dinner. 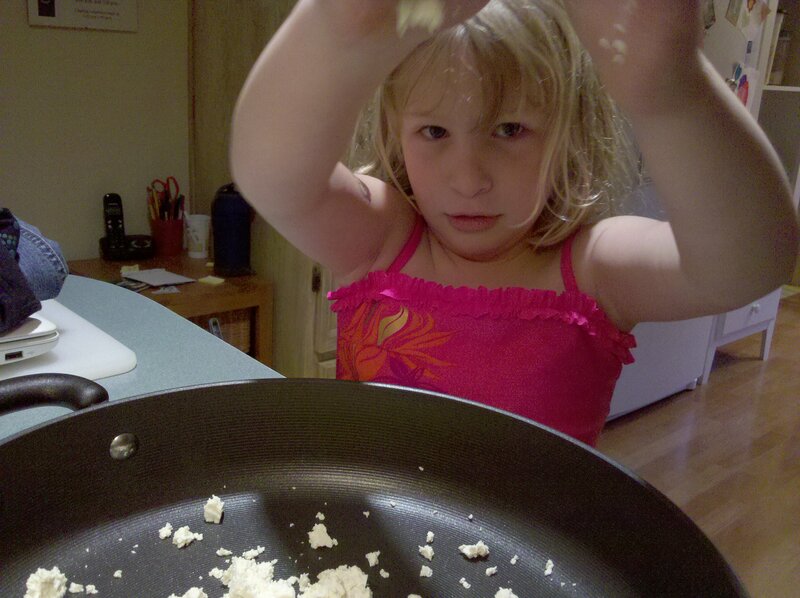 Emma helped make rice noodles and tofu, which ended up a big hit. I think it'll get added to our repertoire of meals. Afterward I took the kids to Jamie's so they could get ready to go to the beach on Thursday. Joanna and I went to the open mic. Joanna played a few songs, getting the whole room singing along to the Beatle's Let It Be. We did have to sit through a fair amount of quirky performers. My favorite was the beatnik cyborg love poetry. Last night was pretty low-key. I stopped by the house to do some odds and ends, managing to get a call in to Emma along the way. I find I've missed the kids more than usual lately with all their trips. Later we headed to Joanna's for an evening of mac-and-cheese and children. 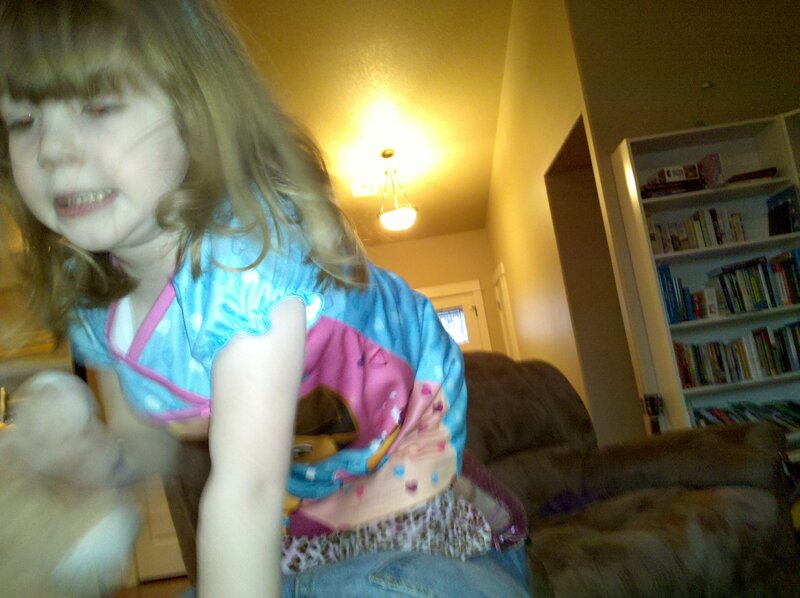 There's evidently some game that involves turning me into a bridge while they climb over me. Fortunately they haven't gotten as big as my kids yet, so the crossings were more comical than excruciating. As for this weekend, I'm not sure if there are any particularly exciting plans. Swimming tonight and gardening if it's nice tomorrow. I'd love to get the other two trees for the front yard. Sunday afternoon the kids arrive, and I'm thinking we can have a Ponyo and pizza night. I made veggie soup today. The fact that it turned purple from the cabbage was just a plus! Emma has returned from Portland. It's very nice having her about, quite the cuddly contrast from the intellectual Sam. She does require a bit more attention, as Sam would cheerfully read or play on the computer all day long. Last night Joanna and her family came over for tacos. Dinner was full and chaotic and happy. 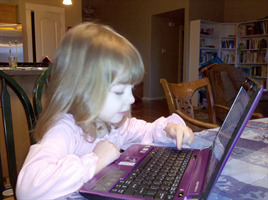 At one point, Sam was helping Duncan with World of Goo while Emma played Littlest Pet Shops with Berry. The respite was brief, but pleasant. Eventually it turned into a "who can pick up whom" game and it was time to go. Emma got into my temporary tattoos and covered her body with them. I didn't escape to work unscathed, and there is now the word "G33K" on my wrist. This morning we cuddled and chatted while Sam slept in. I'll miss her when she heads to the beach for the next few days. I dropped the kids off at my mom's house. Sam wasn't particularly happy and would have preferred to stay at home all day long. When I called back later, my mom had him making aloe. I suppose if some destruction is involved, it can't be too bad. Tonight I'm taking the kids to Jamie's after work as they leave for the beach in the morning. Joanna and I are going to an open mic in a little coffee house two houses down from where I lived when I was eightteen. Hopefully she can play, I can drink coffee, and it'll make for a lovely night out. I met Michael Urban at the common, the site of last summer’s farmer’s market that Urban organized and championed. We talked about the transition from being a commuter to a committed townie, being a stay at home dad, and his next great idea for Grafton- community gardens. Michael Urban is a tall, self-effacing man, who refused to see himself at the center of Grafton’s new local food movement. Instead, he talked about support from the Garden Club, mentorship from the Land Trust, and the satisfaction of providing his children with memories of good food. 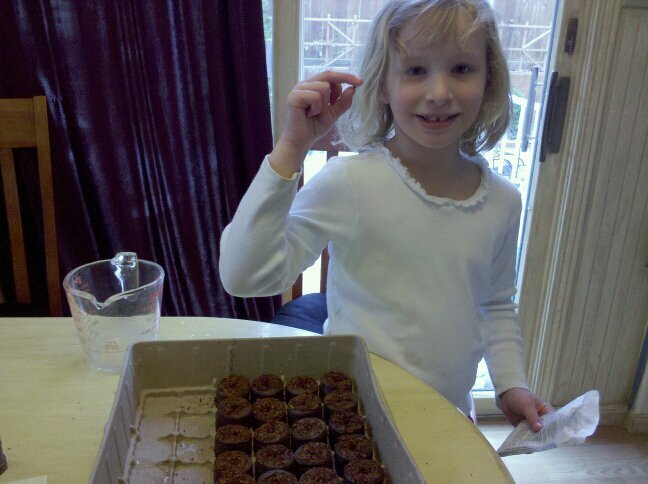 Sadie: When was the seed planted in your head for the community garden? Michael: Well, I’ve found things that I’m passionate about that coincidentally fit into the food movement, but I’ve gone to McDonald’s before. I’m a mainstream guy, but I think there’s a mainstream shift- when I went to college, the green movement was hippy tree-huggers. But this town voted to support Pay-As-You-Throw, a strong stand for recycling. The community garden is available for everyone. I attribute a lot of my engagement to pressure from Ken Web and Ed [Hazzard, former president of the Land Trust]. And I just really like community organizing. I like getting behind an idea and seeing it to fruition. Being a stay-at home dad, my day is centered around three things: breakfast, lunch, and dinner. I’m constantly thinking of what to feed them, and I’d like them to eat healthy. While I love to buy pineapple at Stop and Shop and we rely on the global food chain, I think we’ve lost balance with the local food chain. I’d like to shift from thinking of food as a convenience to get to other thing to making it the main event. That’s helped me focus on the local food movement of Grafton. You can make pasta with local grain and eggs, but my daughter thinks pasta comes from a box! So that’s my goal with my 20 by 20 plot- to grow wheat, harvest it, turn it into flour, and make pasta. And then go over to Ed’s plot and borrow tomatoes, and go to Ken’s and borrow carrots, and make a full meal that’s totally locally grown. I’ve seen it online, and I don’t know anything about the milling process, but I’m just going to wing it [laughs]. Some guys live to fix their VCR, and I’m not that kind of guy. SM: Why are you drawn to local food production and people growing their own food? MU: I want my kids to have memories. I think that’s part of my role as a dad. 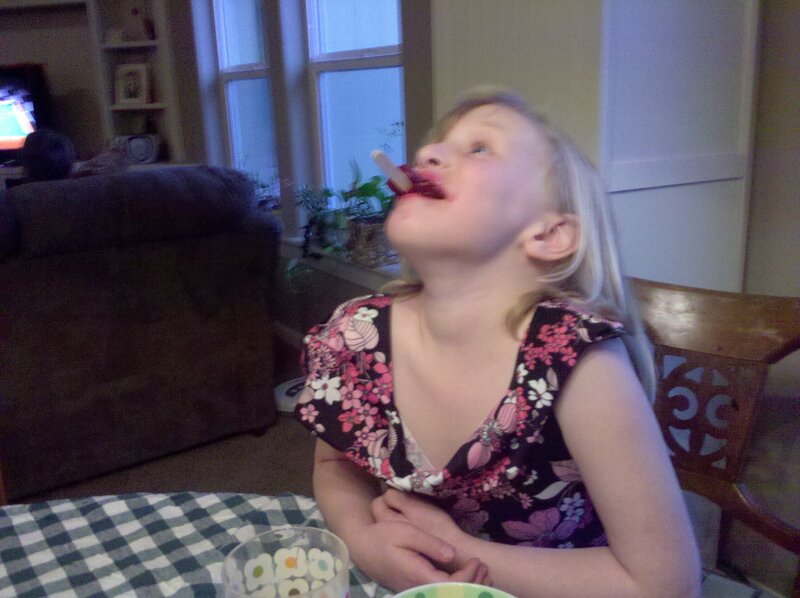 I want Isabel to think back when she’s 36 to that time when she was chomping on an apple at the farmer’s market. And I want Zach to remember running around the community garden, watching Ed and Marian grow basil. I want them to have neat, real memories, not just of Sesame Street. SM: What have you learned about the Grafton community from your work on the farmer’s market and the community garden? MU: I’ve realized that the community is ready for these things. The community was ready for the farmer’s market. I think they’re ready for more environmentally friendly practices, whether they’ve come to terms with the cost of conventional practices or the philosophical benefits of going green. The support we’ve gotten from the community is exceptional. Grafton is full of people who commute to work and work really hard, but they haven’t lost site of the value of supporting environmentally friendly activities. I took Monday off to stay with the kids. While Sam slept in and I wait for Emma to arrive, I was a frenzy of activity about the house. I vacuumed my car, making it look pristine. I continued to clean out the downstairs office, getting it ready for Sam to move his bedroom into. Somewhere in there I managed to make some sweet potato casserole. I finally woke up Sam and we had crepes with tasty whip cream. With a cafe mocha added in, it was like eating a bit of heaven for breakfast, minus the crunchy angels and harps. Emma arrived and there was much cuddling. Eventually we went out for the main journey of the day, redeeming all these gift certificates Sam accumulated. We stopped for lunch and eventually worked our way to drop off some sweet potato casserole for Joanna. She joined us for a walk down by the river where the kids enjoyed throwing rocks. Afterward we headed to Best Buy to wander the aisles looking for something under $20. Evidently that was a mouse. The next stop was Tsunami books where Sam got two Far Side books, and then home to hang out for the rest of the day. Emma and I spent a lot of time outside playing. After dinner, I had both kids laughing and getting their heart rate up playing with the big ball. I liked having both kids around. It's strange to think that in a couple days they'll be off to the beach with Jamie. I'm sure I'll find some way to stay busy. I'm a little sore from hiking, but it's a pleasant sort of feeling. Today was relatively lazy and enjoyable, though I managed a bit of work here and there. I made homemade whole wheat hamburger buns, and gluten free rice crispies. The laundry was done and camping gear was packed away. Sam's chore for the day was to help stain an antique rocking chair my mom gave me. I also cleaned and did touch up painting in the basement office, which will eventually become Sam's bedroom. I met Joanna and her kids at the grocery store, somehow managing to get everyone through the various aisles successfully. Berry wanted to conversely remove my fingers and push me in circles. Somehow we made it to the checkout where I realized I'd forgotten my wallet. Once again, the buddy system of grocery shopping paid off. We made hamburgers, home fries, and steamed green beans. Duncan and Berry amused everyone after eating. Sam seemed highly entertained by it all. I got some sweet text messages from Emma telling me she loved me, which made me miss her all the more. I'm excited I get to see her tomorrow and am taking the day off to hang out with the kids. I'm making crepes, sausages, and espresso, a clear sign that we've returned to sweet civilization. Sam eagerly got on his laptop and is using Google Translate to talk in foreign languages with Chase and Josh. He's gotten very comfortable with typing and chatting online. The camping trip earned an "awesome" rating from Sam. We hiked in about a mile and a half, meeting three people and a dog on the way up. Eventually he wisely declared it was time to set up camp. We wandered a ways into the woods and found an isolated gulley with a fairly level spot for the tent. The tent went up pretty quickly and soon Sam was wanting to try to start a fire. It took a full hour, working away on the flint stones. Eventually we switched tactics and had a blazing camp fire. He was pretty happy using wood and kindling from around the forest floor, which was amazingly abundant. I remembered to dig a proper fire pit and line it with stones, putting it out with a bunch of the water we'd brought along. 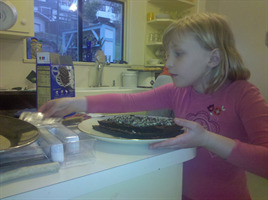 Same ate eight smores and made some hot chocolate. I tried a single one, opting for cereal for dinner instead. We stayed up until nearly ten, chatting and feeding the fire. I had a couple minor injuries poking myself in the dark with sticks, but otherwise it was a fun time chatting and watching the flames. I talked about Summer and the Fall and all the different things that were going to happen. 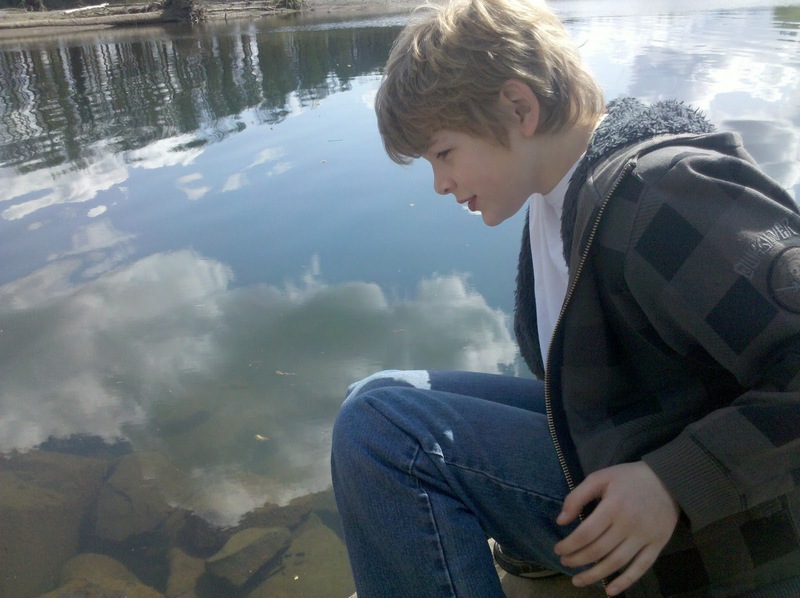 He seemed fine with it all, and we switched topics to video games and science and the universe. In the middle of the night it started pouring rain. I kept waking up, somewhat uncomfortable, but Sam slept pretty well. A bit before eight o'clock we got up, ate some trail mix, and hiked back to the car. Having the Droid around was pretty great, as I kept updating the map, talked to Emma as we hiked back, and maintained a steady stream of text messages and photos with Joanna. You can see some of the places we went, along with photos here. Good times. Joanna, Colette, Berry, and Duncan just left. They dropped off a sleeping bag and stayed for lunch. It was so amazingly sunny and warm that we all ate outside. Duncan played World of Goo and Berry made cake in the sand box. Sam ran about this morning getting everything packed, then took some time to make Half Life 2 mods. He's just getting started, but is doing some surprisingly advanced things. We're about ready to leave for our great hike. I'm using an application for my Droid called My Tracks and theoretically you can look at our progress here. Wish us luck. I'm at work, a mocha pleasantly warming my belly. I have a strange enthusiasm for work today, perhaps because I'm working with some new and interesting technology. Or maybe I'm just well caffienated. I took Joanna to get her MRI yesterday, checking up on her back which was hurt in a car accident nearly twenty years ago. It's bothered her for all her life, and she's started to see what could be done to resolve it. There was an hour delay before they started, so we got home later than expected. Berry and Duncan were enjoying the sun and playing outside. I put myself to work getting dinner and cleaning the kitchen. The kids ate well, but were a bit teary after dinner. There was some speculation about them coming down with something again, as they both have a bit of a cough. I'm looking forward to seeing Sam tonight after work. 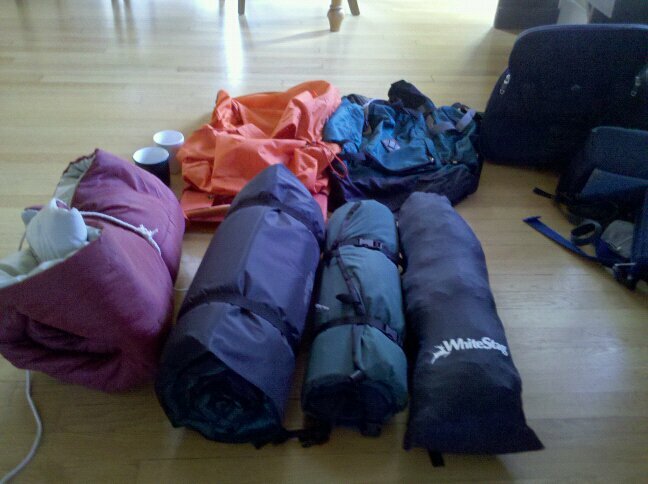 We've got to get ready for our camping trip, loading up backpacks and getting suitably warm clothes together. It's supposed to be nice Saturday and pouring rain Sunday, so I'm planning on getting wet. In case we vanish in the wilderness, we're going here. Joanna has a GPS locator for me too, so theoretically she can track the bear that ate us. I'm self-aware enough to realize that my frenzied activity comes from missing my kids and wanting to fill the time with something productive. On the plus side, my house feels increasingly put together. I did manage to Skype Emma for awhile, which cheered me up until it was time for her to get ready for bed. I do miss that girl. I arranged for the event by chatting with Sam via the Steam game service. I also let him know I bought him jerky so he'd avoid eating me when the food ran out on our upcoming camping trip. The garnished an "lol" from him. I think I've generally grown used to my new life. It still feels like a transition, but the changes don't feel too overwhelming and the people I care about are doing well. I sometimes wish I had more time doing self-indulgent things like reading a book, but then I'd have to give up something I enjoy even more. I'm with Adam. Nothing says rebirth like boiling eggs in everything you can think of. The sun finally came out in Grafton. I just interviewed the organizer of the local farmer's market and community gardens. His exuberance and energy was infectious, and reminded me that greener things are just around the corner. Easter is one of my favorite holidays. I'm not really into bunnies, or chocolate, and the religious significance isn't really my thing. It's admittedly fun to get presents for the kids, though that's not really for me. 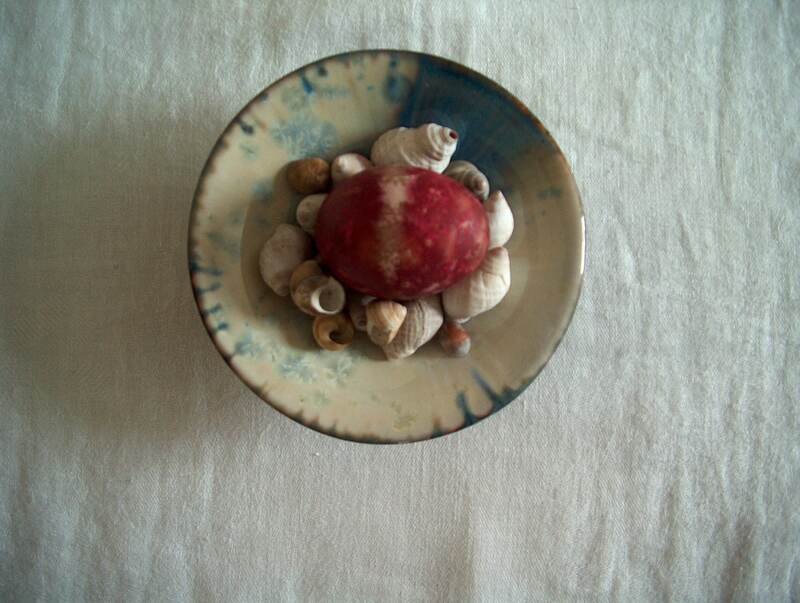 I do, however, really like making Easter eggs. In past years I've applied letter stickers to spell out words, painted dye on with brushes, and all manner of creative things. Jamie had a "two egg per person" rule, so I've had to really limit my creativity in the past. 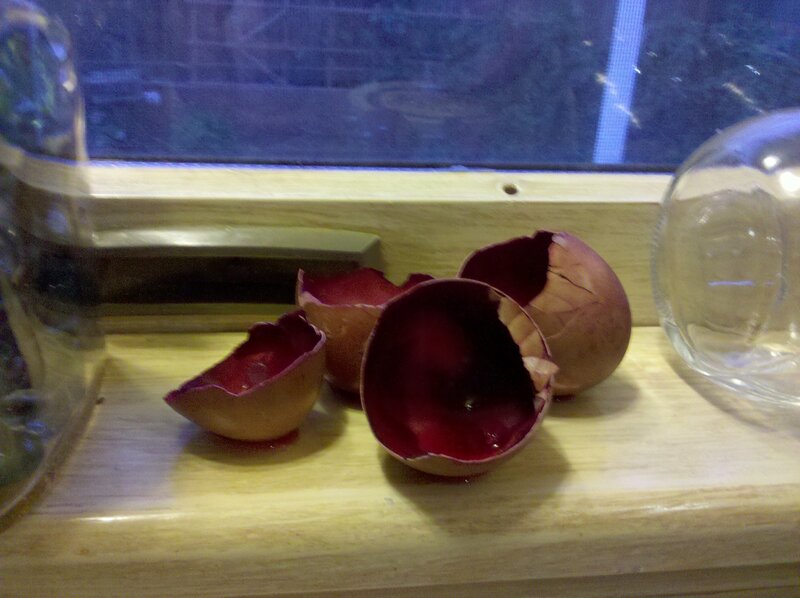 This year I've gone all-out and have been saving eggshells for a few weeks now. When baking and making scrambled eggs, I'd poke a hole in the top in the bottom and blow the yolk out, just like my mom showed me when I was a kid. For Sam's morning egg, I've been saving the broken shells. Last night I cooked up some beets and saved the juice, putting some of the eggs in it overnight. They turned out a pretty burgundy. Supposedly there's a whole list of other things I could try, from carrot tops to tumeric. We'll see how crafty I manage to get. I might end up making a half-dozen hard boiled eggs and trying them out, then getting the traditional color kit for my hollow eggs. Or maybe the kids will get into squishing blueberries to turn things purple. We'll see. I sent the kids off to school this morning and they're off to Jamie's for a few days. It was a little hard to send Emma off as she isn't coming back until after her Portland trip. Hopefully Sam and I can call her in the fancy hotel from the top of the mountain we're hiking on Saturday. Last night we went over to Joanna's after work. It made for a busy night, as we left immediately after I picked them up. 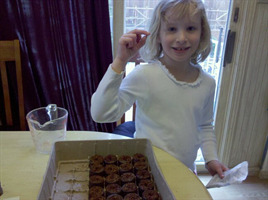 It took a little while, but soon the kids were playing together and Joanna was putting me to work in the kitchen. Duncan really liked Sam, as Sam was being quite silly while playing on the Wii and Duncan kept cracking up. Emma had gotten all dressed up and straightened her hair, then got popcicle juice all over her face. It made for a nice contrast. Otherwise the week has been going along nicely. Sam's big book project got wrapped up last night. Emma's halfway towards memorizing her spelling words. We discovered this morning that laundry levels were critical, so I started up a load before I left. Joanna's taking one of those fun court-mandated parenting classes for three hours tonight, so I'll be at home doing practical things. The plan is to get bark-o-mulch, go food shopping, touch up the living room with paint, finish laundry, and do a bit of baking. 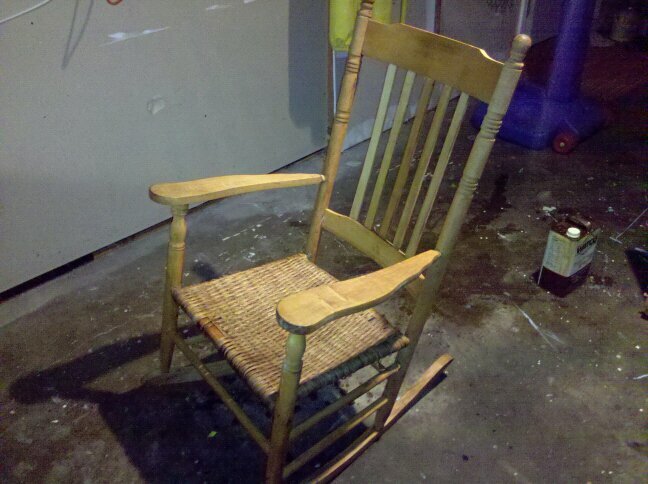 I'd love to start staining the antique rocking chair my mom gave me. We'll see how far I get. We just finished dinner, the daylight streaming in through our windows. It seems odd how bright it is, and that it's time for Emma to hop in the bath momentarily. We all had a lovely day. The kids had a good time at my mom's house. 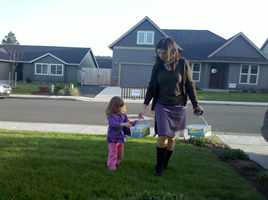 After church, Joanna went food shopping and then came over to hang out. Her plan for the time switch was to have quiet time instead of a full nap, and then we all went out into the garden to play and work. Sam went off with Josh and my mom to see Faust, which he later reported was okay though confusing. Emma did a great job with the smaller kids, bringing them assorted books and checking up on them as they "napped." Later when they were playing in the sand box, she kept them entertained and reported issues with sand and territorial disputes. Duncan was fond of exploring the garden and Berry liked to be a bit mischevious with the sand and dirt. We all managed to get the greens planted, which have been hardening off for the last couple weeks. A short prayer to the Slug Queen will hopefully keep the tender plants safe. We're winding down the day, hopefully getting the kids to bed early. Time changes are always a little challenging. Tomorrow is back to the daily routine, which is nice in its own way. I did have a wonderful weekend, though. It was such a beautiful day yesterday. I picked up the kids in the morning and we had a massive breakfast of crepes, sausages, and whip cream with Joanna and her kids. We played in the basement and ran about, enjoying the lazy day as much as we could. Joanna played Taylor Swift and Beatles for Emma. Berry and Duncan reveled in all the new toys. Eventually we moved to the back yard and worked on gardening, putting down weed blocker and bark-o-mulch. It's nearly ready for planting, which is terribly exciting. Eventually Joanna returned home for nap time. I left Sam power washing and Emma and I went to True Value to pick up assorted supplies. Sam was wet and tired by the time I returned, so it was quiet time for both kids for a couple hours while I finished the job. Everything looks so much nicer after power washing, so it was satisfying to get it done. Emma informed me she made popcorn by herself while watching her video. She's really into cooking these days, and this morning she made rice noodles by herself. After quiet time we ran around at the park, both kids on bikes. Sam has gotten too big for his old one, so I got him on my bike. We eventually got tuckered out and headed home, stopping by the neighbor's for a brief visit. The kids played frisbee and Victoria told me she got a job doing science, which made her immensely happy. Perhaps the economy is picking up again as she'd been looking for a year. We picked up pizza and movies, with Emma having some rice noodles for herself. Emma was strangely afraid of bad dreams last night, though she was fine this morning. Sam and I watched Zombieland and he slept just great. This morning was waffles and the last of the whip cream. The kids are playing on the computers briefly before working on homework. Next is church and taking the kids to my mom's house. Sam and Josh are going to Faust this afternoon. Joanna's visiting some time. I'll probably get some gardening in. All-in-all, should be another beautiful, sunny day doing things I love. When Sam and Emma were little, I'd take them to Stewart Aquatic Center every Friday. It was the Easter Seal pool back then, having changed owners somewhere along the years. It's singular claim to fame was that it was the warmest pool in town, great for little kids and older folks. I watched life guards change, kids grow up, and the pool itself being remodeled. Joanna couldn't get a babysitter for tonight, so we took her kids to the pool. Duncan was fairly tentative, though Berry was very excited. I zoomed her about the pool until Duncan wanted in on the excitement, and they both had a good time. Now they're full of cheese, strawberries, and milk, and are going to bed relatively well. Joanna took some cough syrup and hopefully she'll get some rest tonight. I talked briefly with my own kids today. Emma called and left a message about how she misses me and loves me and wants to play this weekend. I talked to Sam only briefly, but he was very polite. I miss them and am tremendously excited to see them in the morning, massive quantities of whip cream at the ready. I finished up my usual mocha, and am busy munching on carrots and trying to organize my life. Last night was a bit of a whirlwind. I left work and went straight to TrueValue hardware to pick up all manner of things for the house and garden. The paint should be mixed by this weekend, which means I could work on touching up all my spackle marks if the weather is bad. Next stop was gas and food shopping, with Joanna texting me to pick up some milk while I was there. I'm loving my Droid, going through my online shopping list and staying in communication with everyone. After food shopping, I headed off to Jamie's house for what has become a weekly computer servicing event. Sam got Photoshop on his computer and the printer got hooked up to Emma's computer. I also had Jamie sign an IRS document. It turns out that the 2008 taxes were missing some things and we owe $460. Fortunately we should also be getting money back from last year, so it's not that big a deal. After going home, dropping off everything, and cursing the dishwasher for not cleaning very well again, I packed my things and headed down to Creswell. It was a rough night at Joanna's. Berry and Duncan took a long time to get to bed, Joanna was coughing all night, and then the kids were up early. Fortunately everyone was in a better mood in the morning, and Duncan informed me there would be no Tears of Suffering for me to feast upon. In terms of the weekend, I'm not sure if we'll pick up the piano we found on Craigslist, as the woman who had it hasn't gotten back to me. Tonight is swimming and tomorrow I get the kids. For those brave enough to handle the rain, there's endless gardening work. Otherwise it may just be playing inside, painting, and cleaning up the downstairs office. I also assured the kids when I saw them that I'd have a hearty breakfast with way too much whip cream. Good times. 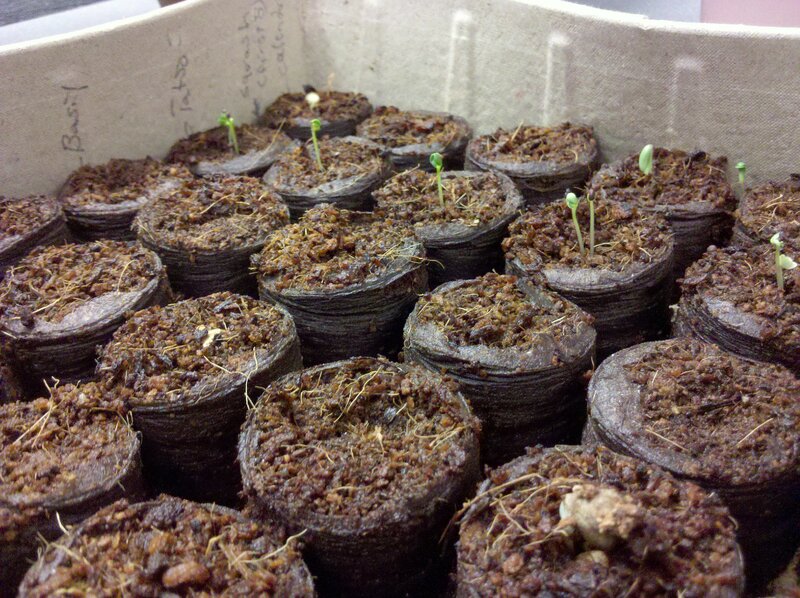 The seedlings are popping up quite nicely. 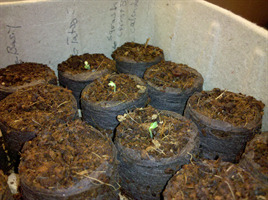 We have nasturtiums, tosoi, squash, and calendula starting to peek out little green heads. I'm using these starter pellets that look like dirt sausages. It's funky, but seems to work pretty well. It'll still be awhile before I can put anything in the ground. I have some lettuce and other greens growing at home, and I took those in due to frost worries. Now it's pouring rain so I'll keep them inside a little longer. Maybe by the end of the month the weather will cooperate. I bought a couple soaker hoses for the beds, as well as bark-o-mulch to cover up the weed blocker. If there's a break from the rain sometime this weekend, I can hook everything up and make it look pretty. You are like a spring of mist. It's hard to believe it's already Thursday. The week has moved along surprisingly quickly. Having the kids was great. Sam's been plugging away at his massive book project, creating a crossword puzzle and wanted poster for Fellowship of the Rings. It's a fairly major reading project, and he has to put in some dedicated time each night. Sam's been very responsible with getting things done though, which is pretty cool. 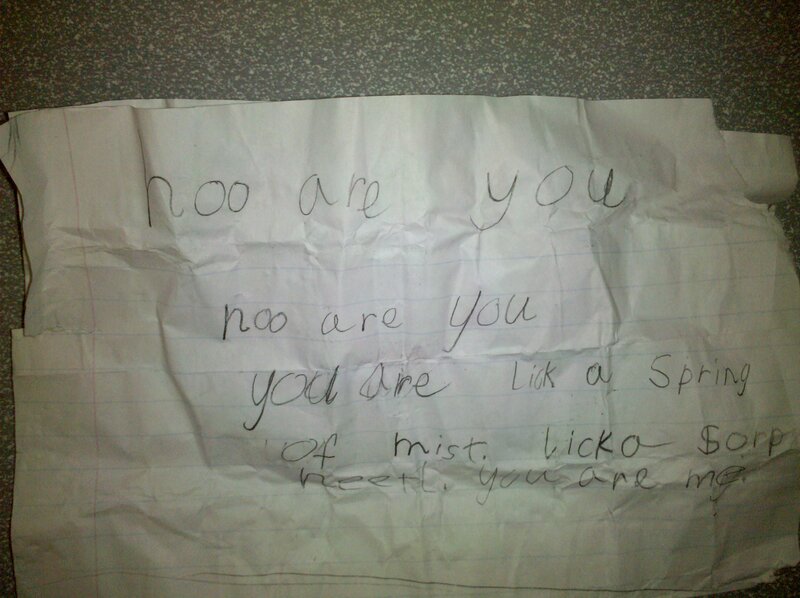 Emma's been working on spelling. Monday she was giving herself pineapple chunks, one for every word she spelled right. I was busy cooking dinner and helping Sam, so the self-rewards were quite helpful. She's also been really into playing wizardry this week, carrying her wand and wizardry book everywhere. Tuesday we went to my mom's house for dinner. Sam hung out with Josh and Emma was amazingly helpful to my mom in the kitchen. It was low-key and pleasant. In the morning I got the kids off to school and they'll be at Jamie's house until Saturday morning. Joanna and I went out swing dancing last night, which was lots of fun. There was a live band and a good turnout. Upon our return home, we looked at assorted pictures Joanna had tucked away before collapsing to bed. It was a bit of a rough morning, with Duncan spending quite awhile in timeout and not really calming down until he got to school. It's hard to separate which issues are due to typical growing up changes and what's from all his family changes. His dad moved to New York only a couple months ago, so it's all still pretty fresh for him. The best we can do is give him stability, structure, and reassurance that he'll be okay. When I came to work this morning, some of the tomato seeds I'd planted yesterday had already started to sprout. Sadly there's nothing so far from the seeds Emma and I planted on Sunday. Hopefully we'll see them pop up soon. Tonight is my bachelor night, full of food shopping, getting paint, and possibly stopping by Jamie's for computer support. This weekend we may end up moving a piano Joanna found on craigslist for free, along with a bit of gardening and hanging out. I have found New Englanders to be warm and welcoming once you've stepped into their home. Otherwise, they steel themselves against the bitterness of March and drive, tight-lipped, from one warm place to the other (Greg says, "well, that's because the chowder's on." Rhode Islanders are the worst). In my half year as a Grafton resident, many of my conversations with locals include a longing to slow residential development and rediscover the heart and soul of Grafton. Although Grafton has direct democratic participation through Town Meeting, ordinary citizens feel unable to affect the larger dynamics of community development. Despite many avenues for citizen voice, the rules of development, codified in our zoning by-laws, seem out of reach. Engaged residents soon realize that neither the planning board nor Town Meeting are designed for deliberative problem-solving. The planning board is committed to abiding by citizen-created zoning laws, but it is the last place to look for broad citizen voice in planning. Simply, the planning board most often acts as an administrative board that implements by-laws, not to incorporate the full spectrum of community knowledge in planning. 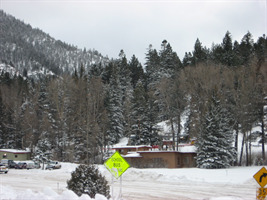 In a special permit application, notified abutters and interested residents have the opportunity to briefly outline concerns regarding the application; and while the board is obligated to hear public input on planning decisions, it must abide by zoning by-laws, even if they do not follow public preferences. But residents can always change zoning through Town Meeting. However, zoning by-laws are often written in confusing legalese that may limit access for citizens who are not trained in planning. Zoning attorneys, real estate developers, and planners are more equipped to make zoning changes for Town Meeting, but have a vested interest in particular forms of development. Residents with an interest in community development are less likely to obtain, read, or understand zoning by-laws, and are thus ill-equipped to shape planning decisions by submitting an article to the Town Meeting Warrant. As a member of the planning board, it’s frustrating to see community residents feel antagonized or sidelined by our current governance systems. Bringing more people into community planning can shift a process from adversarial bargaining between developers and residents to a collaboration between many stakeholders. Such process would not only improve what zoning changes come to Town Meeting, but give citizens the skills and sense of ownership to support comprehensive community development. How can we make sure our neighborhoods keep their character? First, start talking with other people about what makes Grafton a place worth living. Talking about a place we love is infectious and generative. Second, learn more about what other communities do to create value-driven community planning. For example, Traditional Neighborhood District zoning helps make places diverse, dense, and walkable. Shutesbury created its own flexible rules, Natural Resource Protection Zoning, to protect open space within each new development. The Orton Family Foundation helps small communities “adapt to change while maintaining or enhancing the things they value most.” The more we understand what is possible, the more equipped we will be to make that perfect Town Meeting Warrant. And finally, join a committee. Get elected. In addition to being good citizens and neighbors, we have to do real work, together, to rediscover Grafton’s heart and soul. If I count noses correctly, we have ten or 12 people using Verizon, and possibly Greg's family. Robbie, we need to move Ron off your account, because I think you pay for him, and he's actually using Anna's line and phone. I'l l call you. Hugs, the mom who's getting organized. Also, I appealed my property tax evaluation and they knocked $83,000 off the appraised value. It doesn't change the property tax, which I didn't care about, but it will make estate tax issues much simpler, which I did care about. Amazing, back when I was a Beatnik drinking bad wine and writing worse poetry, little did I think I'd worry about taxes. I didn't quite live up to my impossibly high expectations this weekend, but I still managed to do quite a bit. The massive dirt pile in my driveway is gone now, most of it in the raised garden beds. The rest is in the four big pots full of blueberries on the patio and the hole I planted the pear tree in. It felt good to start my garden after putting it off for eight years. I had good intentions, but never quite managed to power wash all the things I wanted to power wash. Still, the computer desk from the basement was moved up and cleaned. Laundry was done and floors were swept. Life seems relatively under control. Saturday morning I picked up the kids and stuffed them full of crepes, sausage, and whip cream. Next I put them to work digging until Joanna came by. She got to do the fun part of holding the tree as I piled in dirt. I kept working away, moving dirt and potting things while the kids had a little downtime. Somehow I stumbled into the shower, cleaned off the worst of it, and gathered up the kids to go to my dad's birthday party. Joanna, Berry, and Duncan came as well, and I introduced them to my big, extended family and friends. Sam hung out with the teenage boys and ate steak for dinner, so much that he turned down chocolate cake later. Emma was amazingly social, somehow getting Jenny to invite her to a pedicure. Duncan and Berry discovered Jordan's room and enjoyed playing with the dozens of dinosaur toys. As for me, I enjoyed visiting with everyone and wishing my dad another happy year. As night fell, we bid our farewells. I got Emma to bed and Sam and I stayed up watching lost. On Sunday we had another massive breakfast, with Emma trying my tofu and egg concoction. Sam went off with Jamie and the gang to see Alice in Wonderland. I took Emma to rendezvous with Joanna and her crew to go clothes shopping. We had a wonderful time drinking Berry's Tears of Suffering which sprung eternal every time she was denied buying yet another thing. Eventually we retired to Applebee's for lunch which had considerably less screaming. John came over to play with Sam while Emma and I did a library run. I returned to yet more household chores and picking up pizza for a special Sunday Pizza and Mythbusters. Joanna and her kids came by, ate relatively well, and then played cheerfully in the basement until it was time to return. Now Emma's in the bath, Sam's putting his lunch together, and I'm thinking of all the things I need to do before bed. Life's very full and busy, but happy too. Happy Birthday Dad!! I hope you have a great day, with just the right amount of rest and family craziness! We love & miss you - can't wait to see you in April! I find myself alone in my big, empty house, a fire crackling next to me. I'm sitting at the antique library table, staring at my massive TV/monitor and sipping a freshly made mocha. I do like the quiet on occasion, though I keenly miss having small children scurrying about. Banana bread is cooking in the oven. Last night was sweet potato casserole, which is practically candy with the amount of butter, cream, and brown sugar I put in. Man does it taste good, though. I've yet to actually get out of my pajamas yet, though fortunately I have some time before I need to leave. Yesterday was my bachelor day, which I filled with cooking and Skyping the kids. Sam called as I drove home from food shopping, asking about gifting video games online. I did what I could, but mostly I listened to he and Chase talking video games and playing video games as he never did turn on his video. Eventually Emma connected with me and we proceeded to chat for an hour. There was a lot of singing and dancing and typing messages to each other. We both left feeling a little sad, but it was good to reconnect with her while she was away. As for tonight, I think Joanna and I will end up at a gardening store and perhaps move some dirt around. 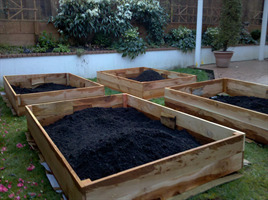 I was hoping to fill the rest of the raised beds last night, but darkness fell and my motivation went with it. In time we'll get the garden put together. The water spigot is nearly ready to be installed. Plant placement planning is underway. It's all very exciting. Tomorrow is dad's birthday shindig at Jenny's. As usual, I have no idea what to get him. Joanna and her kids should come along as well, so it will be quite the introduction to my somewhat large and extended family. It'll prepare her for Easter. As for the rest of the weekend, I'm hoping to just hang out with the kids. Perhaps Emma and I can visit the library. If it's nice, I'd like to get outside for a hike or gardening. After last weekend's practice, Emma's nearly to the point where she can ride a bike by herself. Perhaps I can get both kids down to the park for more of that. Regardless, it'll be nice to spend some time with them. Wednesday was interesting. Berry's school thought she had pink eye, so Joanna and I took her kids over to the hospital to see a pediatrician. Berry was fine, just a cold causing goopier eyes than normal. Even though I work for PeaceHealth, visiting the hospital is a rarity. The views are amazing. After tasty split pea soup for dinner, Joanna and I headed over to song circle, which was just a few blocks from my house. There were fun songs and uplifting songs. I picked If I Were a Rich Man from Fiddler on the Roof, as well as Don't Put Your Finger Up Your Nose from that childhood album we played endlessly. The hostess also sold this amazing sippable chocolate that was delicious. 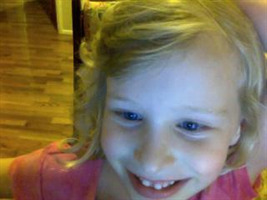 I missed my kids, trying to see if anyone was around for Skyping last night. Emma called, but had a hard time saying anything beyond "hello, hello, hello." Maybe I can call her after school when she's not so tired. I'm being surprisingly productive these days. My bills are all switched to auto pay. The water spigot for the garden beds should be installed today. Hopefully I can finish my taxes and get the rest of the dirt moved over. Maybe I can even power wash the driveway and move the computer desk upstairs. We'll see how much energy I have. Well, everytime I've tried to open my today my internet kicks off-line, and the last family post I wrote was lost, so I'm going to keep this short! A huge thank you to Mom for the little packages of magazines and goodies. They came on my night off, so we all scoured the Smithsonians at the lodge. If anyone knows what the Easter plan is please let me know so I can make travel plans. I can't wait to see everyone - though the thought of growing green things might be nearly as strong of a draw!! I'm working very hard to put in a garden this year. I've ordered four planter boxes, three cubic yards of soil, and have assorted seedlings sprouting away cheerfully. Yesterday afternoon after work, Emma helped me haul dirt, which we spread around. I'm not nearly finished yet, but it felt good to get started. I also got some of the compost in there. 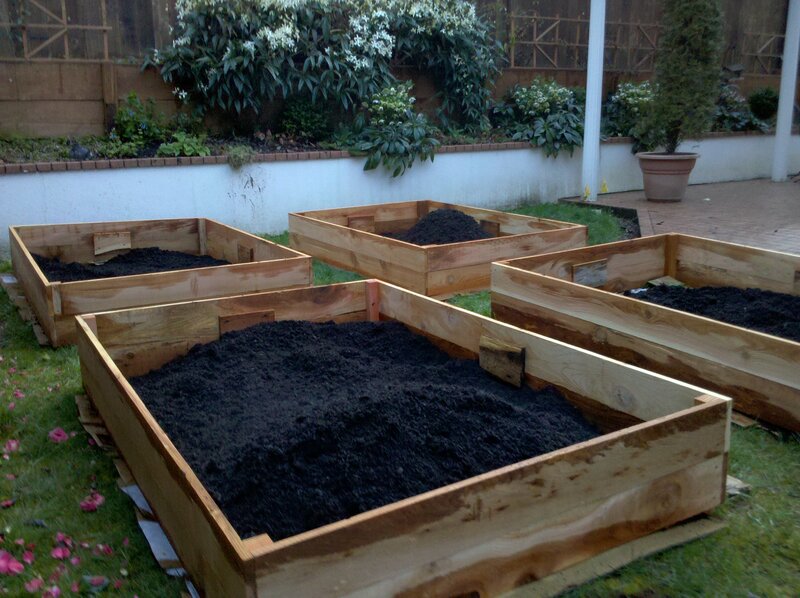 I had this vision of opening up my compost barrel and beautiful black soil would drift out into my wheelbarrow. For starters, the wheelbarrow didn't fit. The compost was more like foul-smelling sludge with bits of twigs and dried leaves. Finally, I had to reach in and pry out they gooey mess, which was exactly as disgusting as it sounds. I hope the plants appreciate it. 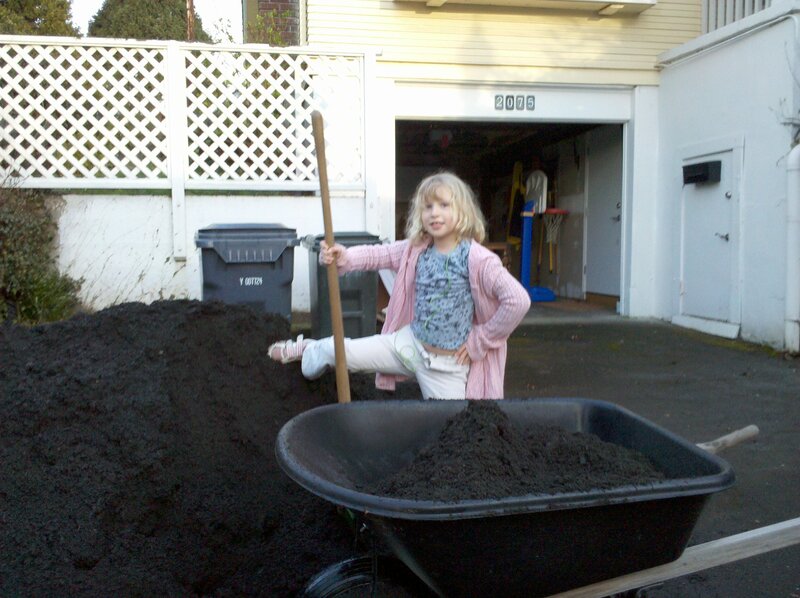 Tomorrow night I hope to finish moving the dirt, and Joanna was going to send along some peat moss and vermiculite. I've also got to call the irrigation guy and put in a spigot to run soaker hoses off of. 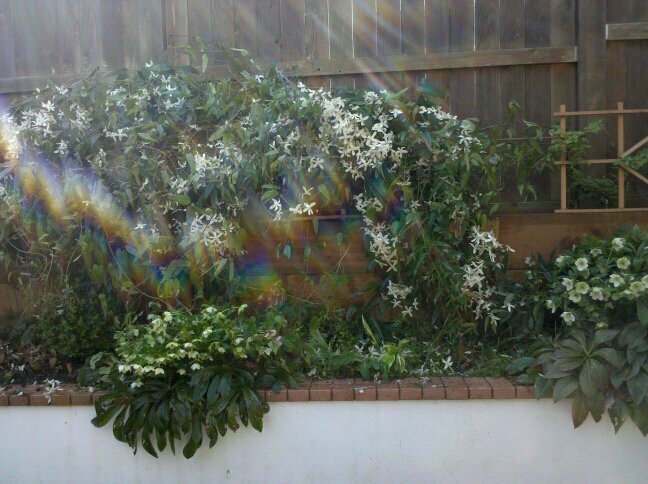 After that, I need to put down weed blocker and bark to make it all look pretty. I'm excited to get some things growing in there. Hopefully within a couple weeks I can watch my little garden grow. My cell phone will receive calls, but I burned out (or rather drowned out) the screen. So you can call me, and if I don't answer, call our home phone and leave a message. I can't see to tell that you called, and I can't go to voice mail, either. 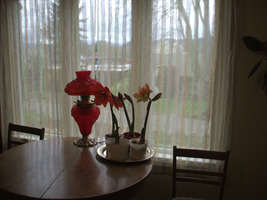 But I got my amaryllis to bloom. Watching Lost DVD's. I haven't posted for a couple of weeks, because we've been as busy as the proverbial paper hangers with fleas. It's been a couple of weeks of doing paperwork, trying to tidy up the last indoor remodeling jobs, and buying things like a beading needle so I can restring a freshwater pearl necklace. Last night Sam and I worked on his latest book report for the story Hatchet, which he read a couple months ago. Before, it was mostly me talking him through the process of creating a report, and also doing most of the typing. Last night, I had to go get Emma in the bath and he cheerfully finished it all himself. He told me that he had to delete an entire sentence that before would cause him to cringe. Now it was a simple matter to erase and start over. Within the last month, he's become a capable typist because he's been chatting with Josh online nearly every night. It's been really interesting to watch and it's nice to see these positive side effects coming out of his social interactions. The weekend has come and gone, and I'm already mostly through my Monday work day. It's felt fairly productive, paying bills and getting 3 cubic yards of soil ordered for the new garden beds. Oh, and I actually worked too. I picked up the kids Saturday morning and proceeded to make my usual crepes and whip cream extravaganza. I offered to take them to Splash!, but instead Sam wanted to invite Chase over to play. The kids ran about while I hung out with Emma, doing house work and getting my life somewhat organized. It was so nice that we spent a lot of time outside and I put down cardboard at the bottom of the garden beds. Eventually Chase went off with his mom and the kids and I entertained ourselves with the gnome candles grandma Sue gave them. Joanna and her kids came over after nap where we played, ate pizza, and watched How It's Made. It's not quite up to Mythbuster standards, but it was educational nonetheless. Everyone liked the cookies afterward, which ended up misshapen but incredibly tasty. Mostly the cookie dough was the glue that kept the chocolate together. Sunday was church and taking the kids to Jamie's to see grandpa Ray. I went food shopping and hung out with Joanna, got the kids, and Emma was tremendously helpful making Thai noodles. It was nice having my kiddos and I'm looking forward to getting them in a few minutes when quitting time rolls around.